Traveling across Ohio with 10 members of the young, mostly single staff-about evenly split between men and women-felt like being part of a political campaign or a social-movement summer camp on wheels. The bus itself felt less like a Greyhound trip than a high-school prom chariot, furnished with string lights, leather captain's chairs, a television, and a kitchenette. Loose M&Ms in bus cup-holders, a stocked snack cabinet, a bottle of whiskey in a drawer, and everyone in the same T-shirt. The staffers, who stayed on institutional message while this reporter was on the bus, exchange inside jokes while they work and wonk out on presidential trivia on their breaks. One communal bathroom in the back means that rule #1 is "No #2." Others, etched on a dry erase board include "be helpful," "clean up after yourself" and "don't change the channel during Bachelor Pad." The bus itself is intended to be sure the group maintains and builds on its elevated profile. Shared power cords snake the tables, floors and walls. Two bus booths serve as an editing bay where mini-documentaries telling women's stories at the rallies are cut minutes after they are shot, and it holds a social media HQ where the content is shared on a Tumblr Tumblr devoted to the 11-state bus tour. The social-media push is key to the field operation-the moment after staffers return to the bus, it's lit blue from their screens. Had Akin made his comment in 2011, before Planned Parenthood had beefed up its digital team and presence, "we wouldn't have gotten it out there in the same way," [one staffer] says. Now they can fire back in real time, and use outrage to raise funds. "We're not under the radar anymore," says field director Emily Jakobsen. Also Planned Parenthood CEO Cecile Richards told the staffers that "The internet is forever," which is kind of great. This energy does, of course, require substantial fuel, thus our dinner at a Brewsters Cafe in Twinsburg that could accommodate 15 people on short notice and offered peanut-butter cheesecake for dessert. 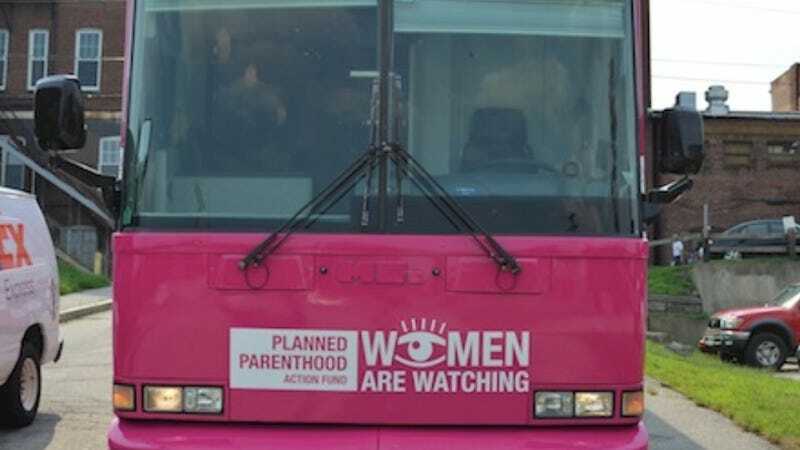 But Ed, an ex-Marine who runs security on the bus, asks the team to remove the pink shirts for dinner as a safety precaution-a reminder of the violence that's been directed at the nation's largest women's-health organization, and also its largest abortion provider. If the pink bus passes by your town, say hi for us.